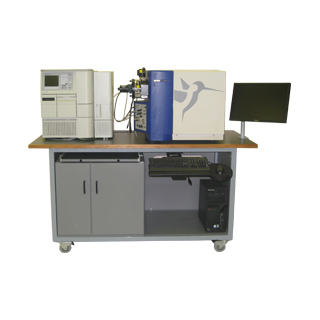 Now available a used fully refurbished & serviced Micromass LCT TOF Mass Spectrometer. Including installation, training and 3 months warranty. MS Workstation (with built in noise reduction) and Waters 2695 Alliance HPLC available at additional costs, please contact us for details. Service contracts also available. The LCT time of flight mass spectrometer is available with electrospray ionisation (ESI) and atmospheric pressure chemical ionisation (APcI). LCT utilises two hexapole RF lenses to transfer ions from the source to the orthogonal acceleration time of flight (TOF) mass analyser. Ions emerging from the analyser are detected by a dual microchannel plate detector and ion counting system. Using the Micromass Z-spray atmospheric pressure ionisation (API) source, two techniques are available. Atmospheric pressure chemical ionisation (APcI) generally produces protonated or deprotonated molecular ions from the sample via a proton transfer (positive ions) or proton abstraction (negative ions) mechanism. The sample is vaporised in a heated nebuliser before emerging into a plasma consisting of solvent ions formed within the atmospheric source by a corona discharge. Proton transfer or abstraction then takes place between the solvent ions and the sample. Eluent flows up to 2 millilitres/minute can be accommodated without splitting the flow. Electrospray ionisation (ESI) takes place as a result of imparting a strong electrical charge to the eluent as it emerges from the nebuliser. An aerosol of charged droplets emerges from the nebuliser. These undergo a reduction in size by solvent evaporation until they have attained a sufficient charge density to allow sample ions to be ejected from the surface of the droplet (“ion evaporation”). A characteristic of ESI spectra is that ions may be singly or multiply charged. Since the mass spectrometer filters ions according to their mass-to-charge ratio (m), compounds of high molecular weight can be determined if multiply charged ions are formed. Eluent flows up to 1 ml/min can be accommodated although it is often preferable with ionisation to split the flow such that 100 to 200 µl/min of eluent enters the mass spectrometer. The optional nanoflow interface allows electrospray ionisation to be performed in the flow rate range 5 to 1000 nanolitres per minute. For a given sample concentration, the ion currents observed in nanoflow are comparable to those seen in normal flow rate electrospray. Great sensitivity gains are therefore observed when similar scan parameters are used, due to the great reductions in sample consumption. The principle components of the ion optical system are shown here in schematic form. Ions generated in the Z-spray source are transferred to the orthogonal time of flight analyser via the two independently pumped RF lenses. After entering the analyser the ion beam is focused into the pusher by the acceleration, focus, steer and tube lenses. The pusher then pulses a section of the beam towards the reflectron, which then reflects ions back to the detector. As ions travel from the pusher to the detector they are separated in mass according to their flight times, with ions of the highest mass to charge ratio (m) arriving later in the spectrum. The pusher may be operated at repetition frequencies of up to 20 kHz, resulting in a full spectrum being recorded by the detector every 50 microseconds. Each spectrum is summed in the histogram memory of the time to digital converter until the histogrammed spectra is transferred to the host PC. If the user has requested an acquisition rate of 1 spectrum/second, each spectrum viewed on the host PC will be the result of summing up to 20,000 individual spectra recorded at the detector. Unlike scanning instruments, the TOF performs parallel detection of all masses within the spectrum at very high sensitivity and acquisition rates. This characteristic is of particular advantage when the instrument is coupled to fast chromatography, since each spectrum is representative of the sample composition at that point in time, irrespective of how rapidly the sample composition is changing.